Hi to all my fellow home chefs here on the east coast of Africa, and around this Beautiful world we live in. So how on Earth am I going to get you to like any old meatball recipes concoction? Hang in there and see, cause today I'm gonna share my mom's recipe with you. Right...... today you and I will be making these meatball recipe smothered in a rich, spicy, tasty tomato gravy the Home Cooking Haven way. This will make your taste buds tickle and your mouth explode with pleasant flavors. Okay ready, first thing grab your apron and let's start with gathering all our ingredients for my Mom's meatball recipe. The easy thing about this recipe is that you can use any mince. Your preference could be beef, chicken, lamb or even veggie for those of us who do not eat meat. So everyone can enjoy using this mouth watering recipe. 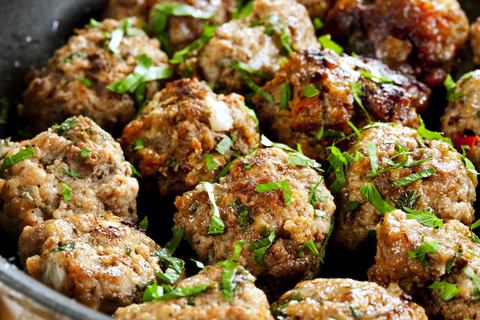 There are many meatball recipes around, but this one is the best!! 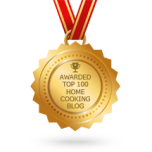 Today, at Home Cooking Haven you and I will be using topside beef mince, and I am really going to enjoy having someone like YOU helping me to make one of my favorite dishes. 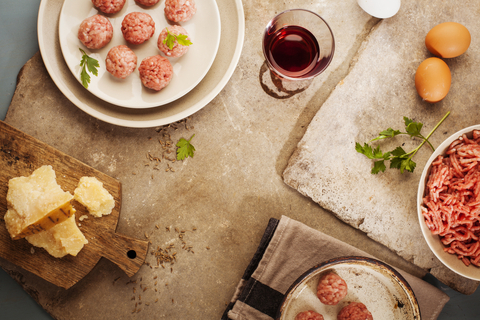 How do you Make Tasty Meatballs? Place breadcrumbs in a bowel and mix with the milk, allow to stand. Using a whisk blend the egg, freshly ground black pepper and the coarse salt. Wash you hands now, as the rest of the mixing of the meatball ingredients is going to be done by hand. 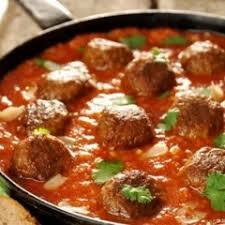 Place your beef mince, garlic, chopped onions, herbs, oregano, parsley and green peppers in a mixing bowl. Now comes the part I like. Mix together using your hands, and don't overwork the mix. Now add the breadcrumbs soaked in the milk. Using a tablespoon scoop out some of the mixture and form into balls shaped to your size preference. While I'm doing this how about turning the oven onto 180° C.
Line your oven dish with tin foil and place your rolled meat balls on the foil leaving a space between each one. Drizzle with olive oil and bake for 15 minutes. Turn over and continue to bake for 15 minutes. Save juice from oven dish for later. How do you make the Best Meatball Sauce? Place a med size pot on your hob. Pour the juice from your meatballs (that you set aside earlier) into your pot. Add garlic, thyme, oregano , green pepper and chillies and stir. Add crushed tomato and grated carrots, stir while bringing to the boil. Turn the heat down to low and simmer for 1½ hours stirring occasionally. When you plate you can pour the sauce over the meatballs. You know, if there is one thing I really enjoy when I'm finished cooking, and I'm sure you will too and that is the plating, it gives me a great sense of satisfaction to see my recipe come alive. But wait my fellow Chefs, before we do this, it is "time out", we have done such a great job together in the kitchen today, now we deserve to relax for a moment sit back and enjoy a glass of our favourite drink. Okay that was great, now we can start plating selecting from various ways of serving our meatball dish i.e. Cauliflower rice/sweet potato mash (for those on the Banting diet). Or just on its own with a lovely fresh bread roll. As a side dish with your meal add a fresh French or Greek salad.